The final cosmetic and visual result through a prescription lens can vary greatly depending on the strength of the prescription required. Some prescriptions can result in thick centres or lens edges. It is possible to reduce the weight and the thickness of a lens using different lens materials and designs; some by as much as 50% thinner than a standard plastic! Thinner lenses are known as Hi-Index materials and are made in both glass and plastic, resulting in a more comfortable lens. 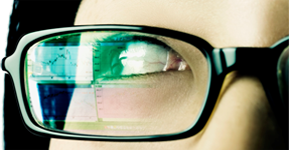 Thinner lenses also result in less magnification, providing an improved visual performance. Lenses can be supplied with a coating which can help protect the lens from minor scuffs and abrasions. This will prolong the life of the lens and keep annoying marks to a minimum. When light hits the surface of a lens some of it is reflected back off the surface causing annoying reflections. Lenses can be supplied with a reflection free coating which allows the light to travel through to your eye so you see more clearly and other people can also see your eyes more clearly! It is highly recommended for night driving to reduce glare from car headlights and also for use with computers, to provide more comfortable vision. Tints are available in a variety of colours and densities. A tint reduces the amount of light reaching your eye. The sun’s rays may damage the eyes and sunglasses are a popular way of providing protection against the harmful effects of UV. Sunglasses should have a BS label to certify that the lenses have a UV filter. Tints can be useful in many situations from driving to playing sports. A tint can cut down glare and improve contrast. Polarising filters reduce glare from horizontal surfaces, particularly useful for reducing glare from roads, water and snow. It is also possible to have lenses that react according to the light conditions. These are known as photochromic lenses. They are virtually clear indoors and darken to a sunglass tint when there is a lot of glare. They darken in UV light, so are completely safe for night driving. There is now a photochromic lens designed for driving in bright conditions. Photochromic lenses are available in single vision, bifocal and varifocal designs.